Cleaning the house on your own is hard. There are so many things that get dirty all the time. Dust is everywhere, somehow there are crumbs on the floor, even though you vacuumed yesterday. It might have rained during the night, and now, your windows are dirty and stained as well. That’s just how the world is. Things get dirty, and we need to clean them. In this guide, we’ll focus on the best, quickest and easiest way to clean your windows, in a quite surprising way. You might be thinking that all you need to clean your windows is a paper towel and a bit of water, or a spray bottle. But, what if we told you there is a better, and faster way to do it. The answer comes in a form known as a squeegee. It’s been used by window washers for a long time, and it might have never dawned on you to try using it. They can help in cleaning your bathroom tiles, shower doors, and garage floors as well. Click here to read more about them. Over a hundred years ago, the first skyscrapers started to rise in the skies. They were the beginning of their kinds, poking the clouds and trying to reach the heavens. But, as with any building, they had windows, and those windows needed to be cleaned. Thus, the idea for this device was born. The first one created was called the Chicago squeegee, and when workers realized just how good it is, the squeegee became a staple tool for cleaning glass surfaces. If you want to be like the pros, you only need a couple of bucks to spend. The entire setup consists of a scrubber, a bucket, a few small towels or lint-free rags, a dishwashing liquid, and of course, a squeegee. You might already have all of these items at home, and they will last for years. This will make you be just like the pros, and with a few minutes of practice, you’ll handle the techniques. The most crucial cleaning item is squeegee, and you need to have some things in stock. When you go to the store, buy three or four more rubber blades for it, since they need to be changed. Professional cleaners change the rubber every day, but you don’t have to. You, don’t clean every day, and a single blade can be used multiple times. However, the blade is nicked, or worn out, don’t hesitate and change it. This goes for anything related to its performance and cleaning ability. You’re all set and ready to start cleaning. To begin, pour a few gallons of water in the bucket and about a teaspoon of washing liquid. Mix it up a little bit until it starts to foam and then dip a sponge in it. Squeeze a bit of the excess water and scrub the glass. Make sure you cover every inch of the glass since it will make it easier to clean afterwards. When the glass is nice and covered in soap, take the squeegee and press the corner of it to the vertical edge of the window. This will create a starting position for you to work from. After this, place the blade in the clean spot and drag it horizontally. Maintain contact during the entire movement and stop when you reach the end of the window. You will have a nice clean segment of glass, just like in the movies. Wipe the blade with a towel and then get ready to do another part of the window. After the first slide, you don’t need to make an edge, you can just go on cleaning. But, you should keep a two-inch overlay and direct the water down the window. Then, wipe the blade and do it again until the entire window is clean. After everything is finished, take a lint free rag and clean the window again. Wipe off any excess dirt from the glass with it and congratulate yourself on a job well done. Here is some more info on window washing that can be helpful to you. 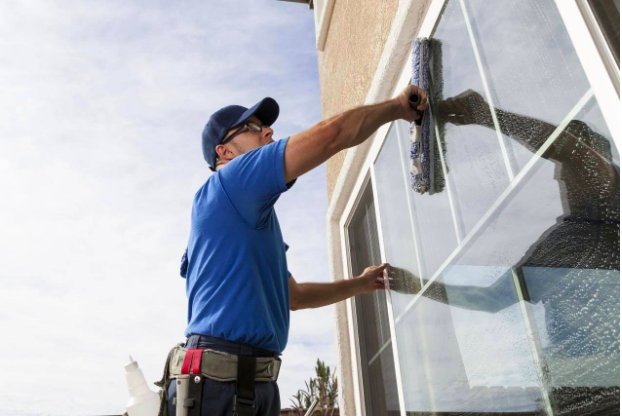 Sometimes, the windows you’ll want to clean won’t be stained by only dirt and dust. In some cases, when people do handy work at home, they accidentally dirty the glass with paint. This is one of the most irritating situations that can happen, and for this, you need a razor blade. Take it and mount it in a holder. Then, wet the window and push the blade across once. Make sure that you’re using a new one to avoid scratching the glass. After you run it once, rinse it and repeat on another section. This helps to avoid trapping debris and other materials that might accidentally scratch the glass. Also, never use a razor blade to clean a tempered glass. And finally, this method can also be used to remove labels as well. Everyone loves the look of freshly cleaned windows. It just gives the house a new, cleaner look. It makes the furniture look brighter, and you’re happy that you did a great job. For the best results, you can become like the pros, and get a squeegee. Follow the tips on how to clean with, and enjoy the magnificent view from your balcony, living room or porch. Yogesh is a professional freelance content writer who loves everything about online world. His interest varies from gadgets to design to futuristic concepts, amazing architectures, and everything that promises to enhance the lifestyle and user-experience.